There is a more mass-efficient type of propulsion that requires much less propellant for the same spacecraft and mission. Rather than ejecting hot gases that are products of a combustion process, electric propulsion systems eject charged particles using electromagnetic forces. In an "ion engine'' the atoms of an inert gas, usually xenon, are ionized and shot out at a much higher velocity than in a normal rocket engine; while an engine burning liquid propellants may shoot out hot gases at 4.5 kilometers per second (3 miles per second), an ion engine expels its charged atoms at more than four times this speed. This makes ion engines much more efficient, giving the same impulse and therefore enabling the same increase in spacecraft orbital velocity or rotational velocity management (in the case of attitude control) for much less propellant. 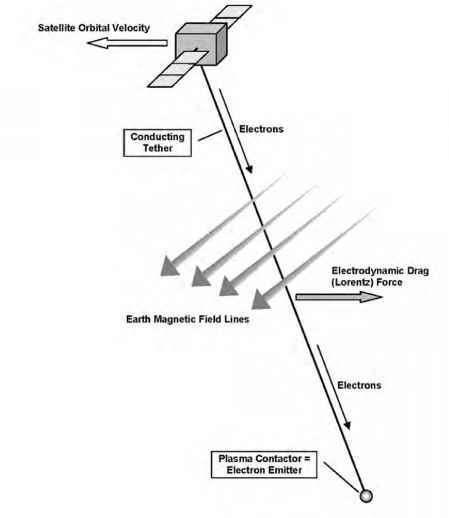 Ion engines are already widely used as attitude control thrusters for large communications satellites and are now also employed as a means of propulsion for interplanetary missions (Fig. 2.6). rocket engines the energy that propels the gases out of the nozzle at high speed comes from the combustion of chemical propellants. An ion engine requires a strong magnetic field to charge and accelerate gas atoms, and for that it needs electricity. This is supplied by the Sun through the solar arrays, which is why the concept is usually referred to as solar electric propulsion. It means that spacecraft with electric propulsion require larger and thus heavier solar arrays than similar probes with chemical propulsion systems. More serious is the problem that ion engines can produce only tiny thrust levels, on the order of the weight of a sheet of paper. Electric propulsion, therefore, can be used only in space; on Earth an ion engine is not even capable of lifting its own weight, let alone a spacecraft. The extremely low thrust means that a spacecraft with ion engines can manage only very small acceleration levels, on the order of a fraction of a millimeter (a hundredth of an inch) per second every second. To increase the velocity by 1 meter per second can take more than an hour. Interplanetary probes using electric propulsion thus take much more time to reach their target, which increases operations costs and the wear and tear on spacecraft equipment. Moreover, the tiny thrust levels mean that ion engines have to run for much longer durations than conventional engines, which increases the risk of failure. 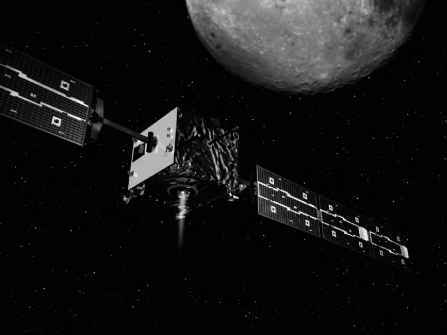 The ESA's SMART-1 spacecraft, a lunar satellite whose main mission was to flight test solar electric propulsion for future deep space missions, took 16 months and 332 ever-widening orbits around Earth to reach the moon. With some short boosts from a conventional rocket engine it would have taken a similar probe only a couple of days to get there. With respect to conventional propulsion systems, solar-electric systems trade high thrust levels for increased efficiency and therefore lower propellant consumption, resulting in a lower propellant mass (and thus a lower total spacecraft mass or the possibility to incorporate more scientific equipment). Ion engines are thus very efficient, but using them means considerably stretching the duration of interplanetary transfers and orbit adjustments, and precludes the use of quick and sudden maneuvers. This makes solar electric propulsion fairly useless for crewed space missions, which require transfers that are as short as possible to limit adverse physiological and psychological effects and to minimize the amount of water, air, and food needed onboard.